Christoph Willibald Gluck was one of the first composers, along with his favored librettist Ranieri de” Calzabigi, to attempt to reform opera into a complete artwork. The ideal was a seamless fusion of music, drama, singing, and dance with a clear plot based on classical ideals. He’d already written nearly 25 operas by the time his Orfeo ed Euridice premiered in Vienna in 1762 starring the alto Gaetano Guadagni. Gluck took the opportunity to refashion the work 12 years later to the tastes of the Parisian public by adapting the vocal line for a high tenor (“haute-contre”) and adding ballet (a whole heap o” ballet) to please the Parisians and thereby finally gained popular favor for his work. Now the waters start to get muddier. A hundred years on Hector Berlioz, himself a great disciple of Gluck’s music and teachings, at the suggestion of Giacomo Meyerbeer and with the assistance of Camille Saint-Saens, combined all the best bits from both the Vienna and Paris versions. He then lowered the vocal line for none other than the great contralto Pauline Viardot then at the height of her formidable vocal prowess. The cadenza she and Berlioz fashioned for the great Act I showstopper, ”L’espoir renaît dans mon âme” still gives one pause. The downside to having this opera now available in nearly every key signature was that the doors were then flung wide open to a whole host of singers, countertenors mind you, even baritones mon dieu, allowing them to have a bash at portraying this noble hero and devoted husband. My own histoire with Gluck’s masterwork began in 1990 when, as a neophyte opera fan I was a last minute invitee to an LA Opera performance. Innocent to the entire score save the big number in the last act I was absolutely gobsmacked by Marilyn Horne, Benita Valente and Tracy Dahl. Reviews of the production from back in the day complain about the borrowed staging (from Santa Fe Opera), the mish-mash of musical editions used, and the age of the participants (L.A. Times music critic Martin Bernheimer had no shame). As a complete newbie to Gluck’s oeuvre I still have vivid memories to this day of General Horne plowing her way through those Act I fireworks in spectacular fashion and then descending, via stairs (in those boots) into the orchestra pit on her journey to Hell. So I merrilly took the journey Saturday night through the driving rain to the Dorothy Chandler Pavilion, its patrons enjoying their own Hellscape right now in the form of reconstruction of its public plaza, to see a new co-production designed, choreographed, and directed by the esteemed John Neumeier. Presented by Lyric Opera of Chicago in cooperation with the Joffrey Ballet last fall, after its run here it will travel to the Hamburg Staatsoper next year. Mr. Neumeier adapted the story close to home, making Orpheus a choreographer and his wife a star ballerina. They have a public spat during a rehearsal (staged and danced to during the Overture) and she leaves angry, dying shortly in a car crash the immediate after-effects of which are revealed onstage following the conclusion of the music. This sets in motion the chorus of grieving friends and starts Orpheus’ own journey. Since the story is updated to modern times Mr. Neumeier makes the practical choice of focusing not on the fantastical journey of Orpheus into the underworld to save his wife but the more realistic tale of his grief and his journey through it to the other side and back to his own life. An especially poignant moment brings all this clear to the audience towards the very end of the staging and it was at that moment that I was really starting to wonder how (or “if”) we were going to bring someone “back from the dead” as it were. The Joffrey Ballet is a large group and 42 dancers are named in the program. They had the run of the stage since the chorus made their contributions from the orchestra pit. Mr. Neumeier has been head of the Hamburg ballet for over 40 years and they seemed well equipped to handle his particular vocabulary of dance. He speaks over a broad range of dance starting with classical postures and movements all the way through modern dance and even urban street dancing. His constant ingenious invention with types of lifts and the way he favors waves of movement throughout the entire corps was a particular pleasure to the eye. He also has a healthy sense of humor since he gave the denizens of Hades their own peculiar set of “Walking Dead” movements. His set designs were no less fluid and they comprised of a series of right-angled room corners that flowed freely over the stage as necessary. There was also use of Arnold Bocklin’s painting “The Isle of the Dead” in various formats throughout to dynamic effect. Also some exceptional mirror play with dance doubles between Orpheus and Eurydice that was fascinating. Mr. Neumeier’s costumes were uniformly excellent as well. Utilizing beautiful fabrics with lots of movement, save for the pleather studded furies which momentarily elicited minor head scratching and a little tittering from the audience. Liv Redpath, in her second year with the Domingo-Colburn-Stein Young Artists Program, veritably shone in the role of Amore. Her character as part of the real world was Orpheus” young male assistant so nothing fantastical except her voice which was clean and bright and exceptionally attuned to the tricky rhythms in Gluck’s writing. She brings great pleasure when she sings and remains a voice to follow. 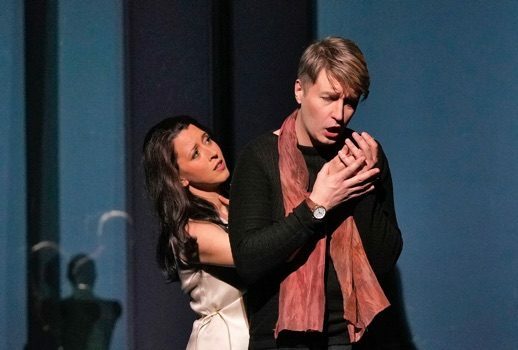 The real star-making performance here however is Russian tenor Maxim Mironov as Orpheus. In what has to be one of the most challenging roles in the repertoire he showed a passionate conviction that never made you doubt for a moment he would succeed. His cries of, “Eurydice” rang out true and strong from the first and he did an exquisite job of differentiating the strophic sections of, “Objet de mon amour,” equal parts dulcet and fiery. But it was the finale of the first scene with,”L’espoir renaît dans mon âme’, that he truly brought down the house. To my absolute astonishment he actually joined some of the most florid phrases together on more than one occasion in the piece and his dexterity and evenness of scale were astounding. He made a very believable impression on stage as a ballet master and his voice mines silver when he sings with a nice ping and a honest-to-goodness real trill. Bravo! James Conlon in the pit coaxed a mighty sound from the reduced orchestra who played with modern tone but baroque style and accents in a nice conceit. The “Dance of the Furies” was especially exciting with its contrapuntal horns really leaning in hard. Maestro Conlon also kept the highest position in the pit I’ve seen thereby staying finely attuned to the dancers throughout making certain they had their necessary musical space. It is, after all, a very dance-heavy presentation and it really seemed that the Joffrey were the real stars of the evening. It’s good to see the return of Gluck’s own Paris revisions for high tenor receiving serious attention again (I can strongly recommend Juan Diego Florez‘ live recording from Madrid released by Decca) and with the added plus of so many gifted interpreters. John Neumeier proved a near perfect choice to oversee this project. Meanwhile the Joffrey Ballet brought their acclaimed production of Prokofiev’s “Romeo and Juliet” to the Music Center for the off nights in between. Performances continue through the end of March.